It occurs to me as I roll out of my bunk at 10am a couple hours ahead of my noon shift that one really needs to be a morning person to do this. Five shifts every two days means five mornings every two do this. Five shifts every two days means five mornings every two days. So far I’ve had somewhere around 30 mornings in 11days all of them after under three hours sleep, most of them after two. 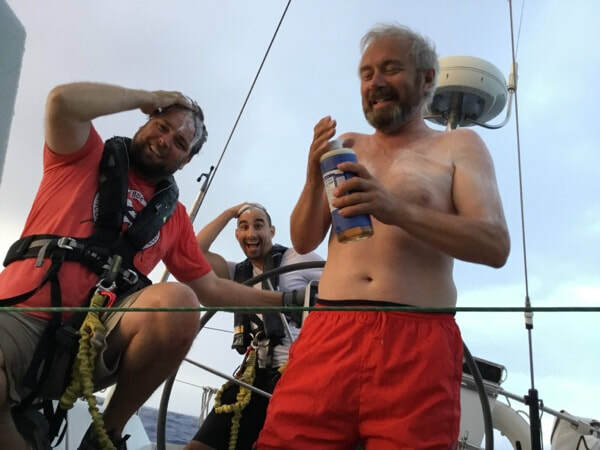 The crew headed down is always irritatingly happy and one has to put aside their morning grumpies as they try to negotiate the rolling boat and get clothes on. This has become easier as the weather has improved as what we sleep in is what we sail in. Actually, that’s not true, I haven’t seen Dave’s Santa pajamas on deck yet. Anyway, today I thought I’d get a bit geeky for anyone on shore wondering about our sail options and choices. Let’s call today Sail Inventory Sunday! Catchy! As long as today is in fact Sunday...First off we have a main sail. It stays up all the time, because, well, it’s the mail sail! It has three reef points which are means to make it smaller should it get too windy to carry all of its power. So far we haven’t had to reef in this race. We have two upwind foresails. Our #1 is 509 sqft. And is our go to for anything up to 18 knots. 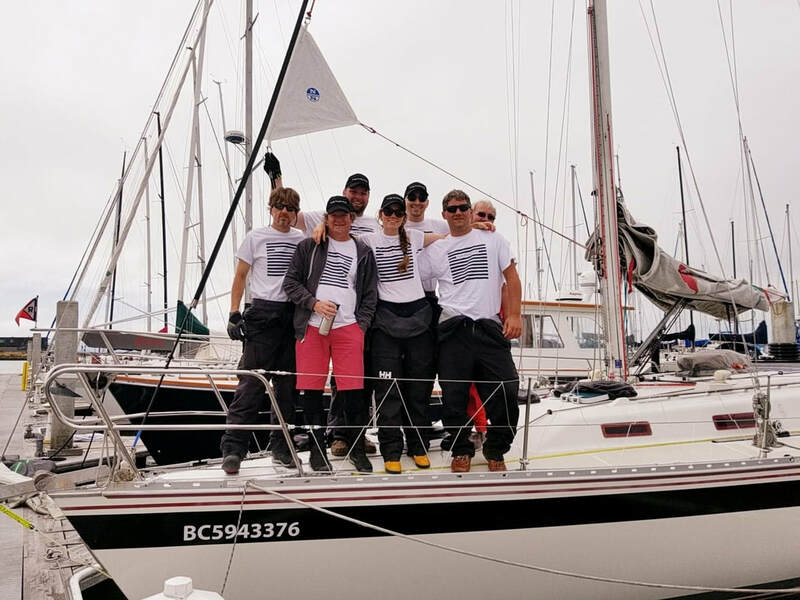 It was up for the first three days of his race as we slatted our way through the light airs. I have a feeling when we assess its condition after this race it is the sail that has taken the most abuse. 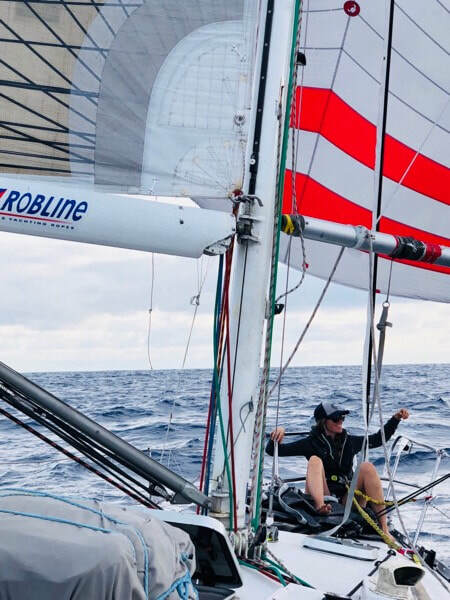 Flapping around against rigging as lifelines and so on is really bad for sails.Our other upwind sail is our 339 sqft #3. 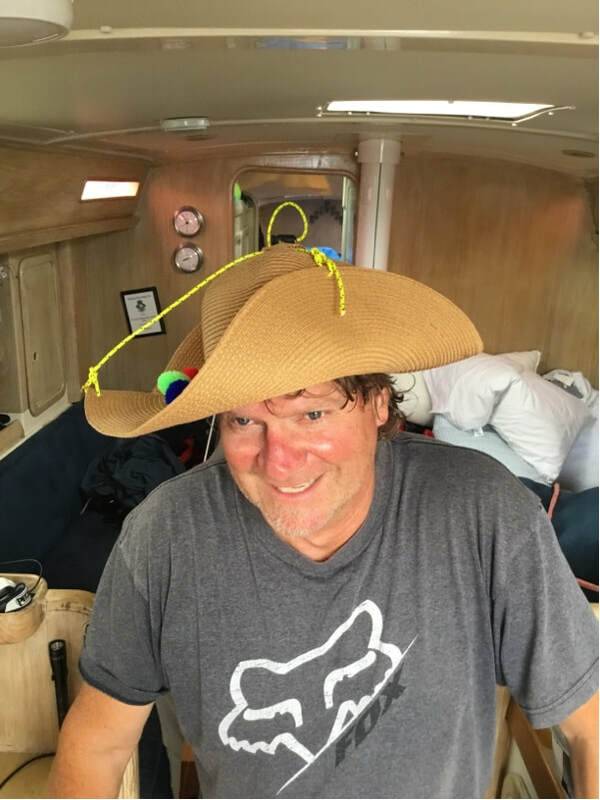 This is heavier material than the #1, also made of carbon and Kevlar, and is good for winds upwards of 30 knots of breeze. So far we have used his sail only once for blast reaching briefly, and it has been an occasional go to when we have had to deal with longer head sail changes. It’s always on deck and rigged ready to go at any time. After our #3 we have a #4 which is similar to a sheet of plywood, and a storm jib which is like two sheets of plywood. These sails will have stayed in the bag for the entire trip and so far have only been used as extra weight on the upwind side of the boat as we stack sails on deck to help keep the boat level. 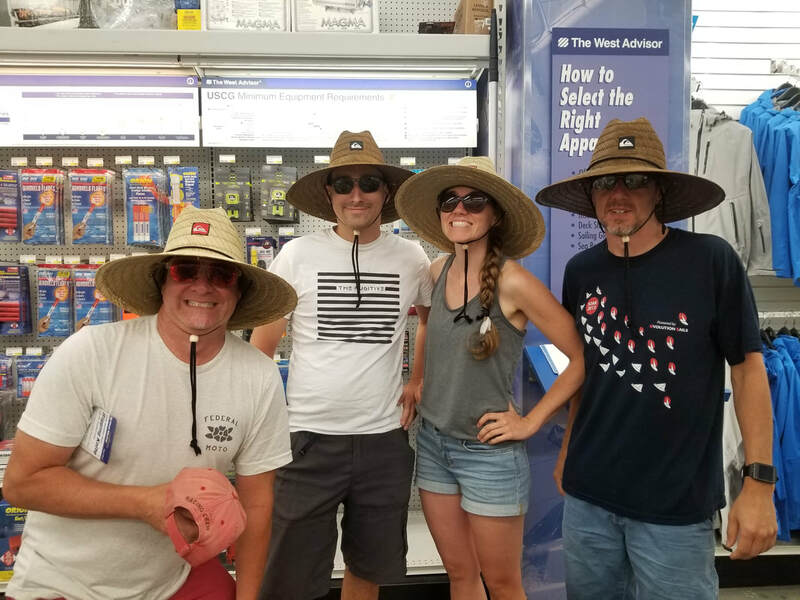 Now for our downwind sail inventory. We have an A-0 (code-0), an A-2, an S-1, S-2 and S-3. Our A-0 is a light air reacher that we thought we would use more, but has remained in its bag, and likely will stay there. The useful wind angles for this sail are quite narrow and we just haven’t had the conditions for it. Our A-2 is our go to reacher with a nice hot band of useful wind angle. It has been used a few times when our transition from upwind to downwind d sailing was happening. I don’t expect to see it again this trip. As we get closer to the finish the wind has swung predictably further behind us. The A-2 is 1121 sqft and is called “A” because it is an asymmetric triangle. So that brings us to our “S” kites, or symmetrical spinnakers. Our S-3 is a 1oz narrow shouldered all around kite that is 992 sqft. We have gone to this spinnaker at night on a few occasions when our bigger kites become a handful in squalls. We have also used it in combination with our #3 to reach hard. The S-3 provided the forward power while the #3 kept the bow pushed down. Our S-2 is a .5oz broad shouldered beast that is 1054 sqft. 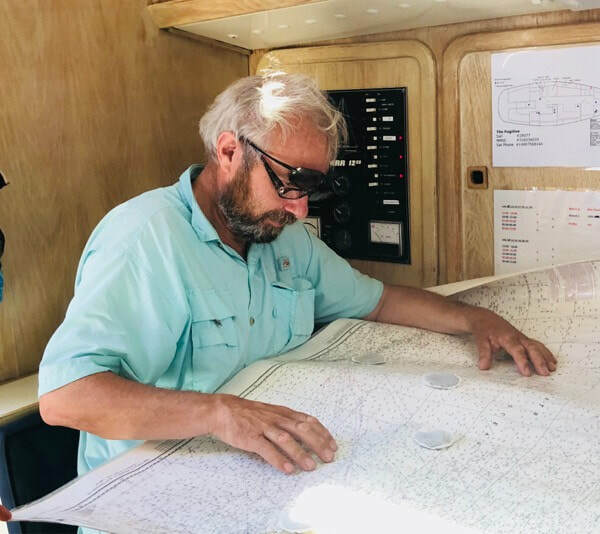 We haven’t used it often this trip as it’s very light cloth and even in light airs the sea state can knock the sail around and the risk of tearing is too much. It’s also a better reaching sail than any of the other S kites. Our go to kite is our 1oz S-1. 1151 sqft of love that is currently bringing us home. It flys well in the really light 10 knots of breeze and would last much longer than the crew in 30 knots. That’s my little sail geek morning briefing for y’all. I have to be should go. I’ll do a crew brief later. Tomorrow if you want I can do a navigation lesson on how we find the needle in the haystack that is Hawaii. First flying fish sighting today! They jump out of the water to avoid their predators but these guys took one look at our big grey and red spinnaker and seemed happier back in the water. Alie holds all three speed records from yesterday. In an unrelated story the unofficial number of nighttime broaches is also held by Alie. 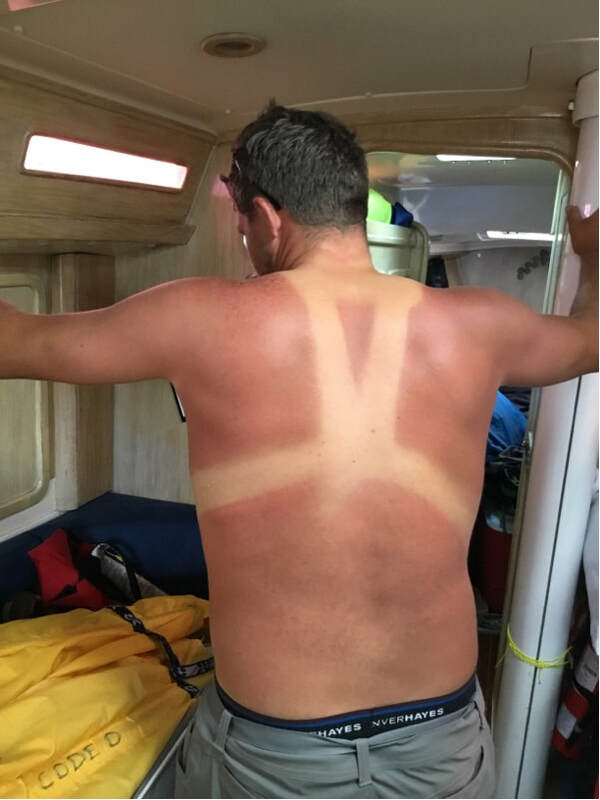 Life on board can be a bit rough depending on the sea state. All three walls in the head have Kevin’s face prints on them. And Dave seemed a little sore after a slide down the deck last night. They are both fine but it is a reminder that what we are doing can take its toll on the body. Occasionally Benjamin plays the guitar and there are always jokes flying back and forth. If anyone has met this crew that would not come as a surprise. Without access to Google more of what Tegan says seems factual than normal, I’m keeping a list so we can fact check once in port. Ian so far has worn a dress shirt and jeans the entire trip. Today he is wearing a shirt he insists is “salmon” colored. Again, where is google when you need it. And lastly I try to keep the crew happy with tokens of love and caring. After using the head I like to fold the ends of the toilet paper roll like they do in hotels. No one seems to have noticed so I now also draw a little heart on there too. That’s it from John on the boat. Happy Monday Everyone! Day 5 sees more urgent attention to personal hygiene. Yesterday John shaved with salt water and sunscreen. Today John's face feels sore. Baby wipes are the new hot 10 minute shower and medicated Gold Bond is... well... the new hot ten minute shower. We are slowly introducing these items to Tegan so as not to confuse him. Watch 1, Tegan, John, and Kevin were postulating the night away discussing how crazy our friends would think we were if we crammed 7 people into a Winnebago you weren't allowed to leave and drove it around 35kms for two weeks with the headlights off at night. If that doesn't make sense, then why should this!?!
" 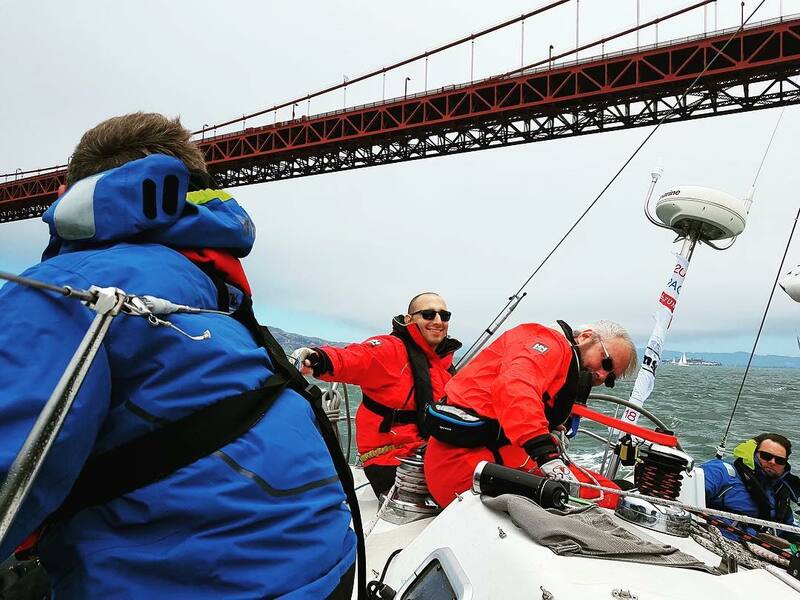 We are currently reaching fast in 18 knots of wind, the sky has cleared and the water is crazy blue. The waves are stacking up a bit so surfing is common into the 10knot range. We had a squall last night that produced 30 knots and taught us to be a little more conservative when it's dark out :). The crew is in great spirits and we are really having fun. Most of our goals so far have been met. Watch A has come up with an amazing acapella three part harmony song about things that probably shouldn't be sung about. Watch 1 has taken a more sports oriented approach to skill development and Tegan and John can catch M&M's thrown from basically anywhere on the boat into their mouths in the cockpit. Animals so far. Around the Farallones during the first night we were pursued by three curious sea lions. Watch A had a whale about the same size as the boat swim all around and under the boat at quite high rates of speed. And Watch 1 had dolphins playing in the wake in the pitch black of night. We could see the dolphins coming because they glowed with phosphorescence. " Thanks John for the great update, any one have questions they would like to ask the crew? Curious about the songs Watch A has been singing (however we are hesitant to ask...)? Let us know and we will do our best to find out. They are loving and appreciate all the support coming from home, here's wishing them continued success into Day 5! We are a little behind on updating the website, but here we are. 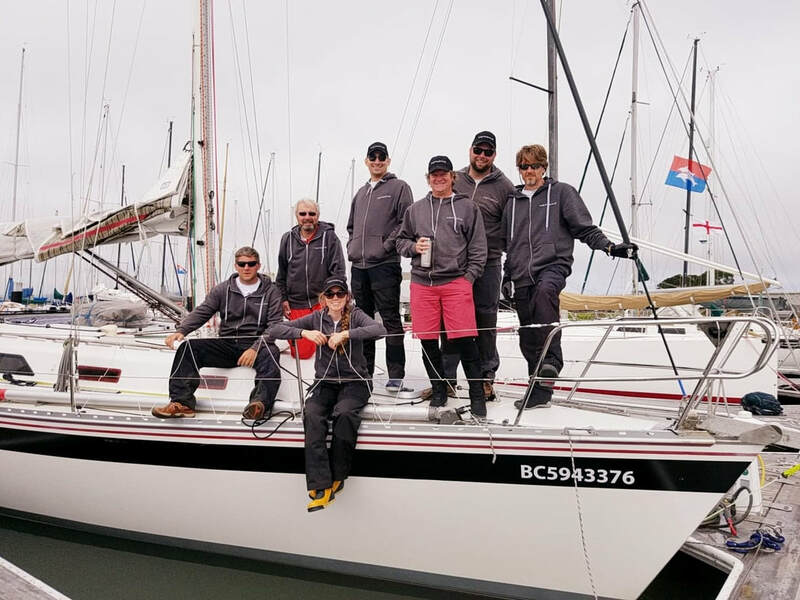 It's been a little over a week since the crew headed down to San Fransisco with some final preparations before starting the Pacific Cup Race to Hawaii on July 11, 2018. 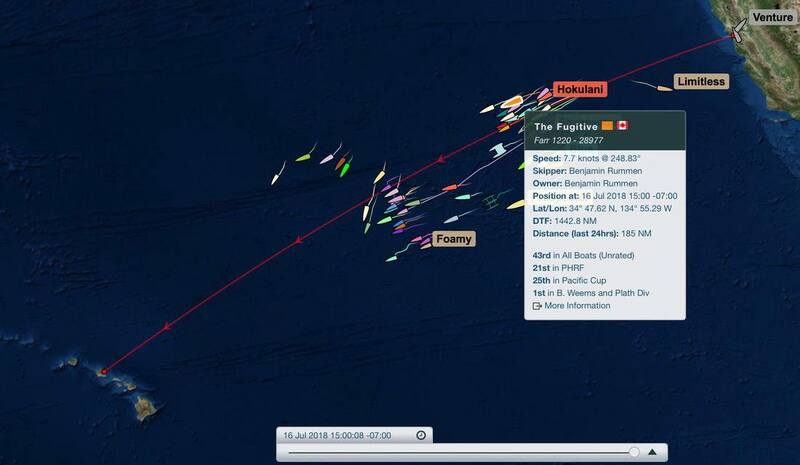 You can as always track the boats via the official tracker located here but please note, there is a 6 hour delay (to keep the race competitive). The media crew have been providing great updates on the official website, and we highly encourage you to check those out here. 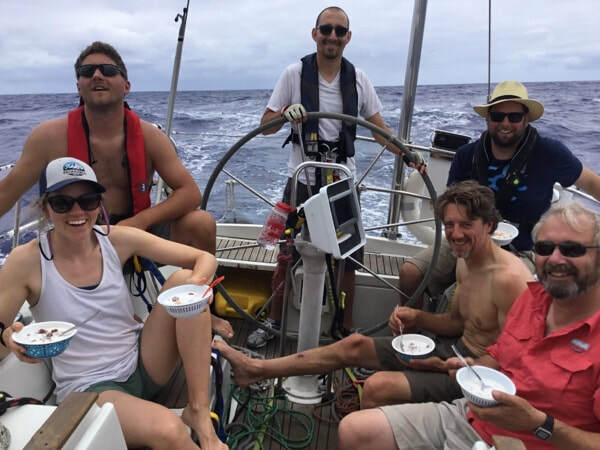 One of the latest updates from the boat, Alie has been rocking the helm, Ian did some cleaning in the light to no winds they are currently in, and the food has been amazing. Be sure to keep following our Facebook and Instagram sites for pictures and updates.